The first mortal battles were those of nature, red in tooth and claw–beasts struggling among each other, fighting with sharp claws, piercing teeth, or lashing tails. But then came man and his fellow races, primitive at first, using simple clubs and spears, conquering the beasts of the wild. Soon the mortal races abandoned their simple stone bludgeons for blades, taking up cold iron and haughty steel to war. And soon–or perhaps even already–the mortal races, ever inventing new tools and weapons, will discover a force much greater than any club or sword: the gun. The firearm, sleek, compact, and ruthlessly powerful. A knight, armored in full plate and trained for years in the noble art of the greatsword could be downed from a hundred feet by a peasant with a musket, and a master duelist could be shot down before he had a chance to draw his sword by a pistol-wielding gunslinger. And just as the sword had its true masters, the martial adepts of the Sublime Way, so too might the gun find its exalted wielders, martial adepts of the tenth path, the discipline of Black Rain. An art of finesse and ruthless power, the Black Rain discipline promises its wielders the true power of the gun. The Black Rain discipline’s associated skill is Spot, as a sharp and unwavering aim is essential to sublime gunslinging. All firearms, as well as the concussion blaster, death ray, firewand and wandgun are associated weapons of the Black Rain discipline. Because the Black Rain discipline was never taught at the Temple of the Nine Swords or any similar center of training, most martial adepts do not know any maneuvers from it, or even know it exists. Any martial adept can learn maneuvers from the Black Rain discipline, but they must either have the Exotic Weapon Proficiency (Firearms) feat or otherwise be proficient with firearms to do so. There are two ways to master the discipline. The first is to have been trained in it. If you choose to make a martial adept that has already been trained in the Black Rain discipline, you simply replace one discipline that adept could normally learn with maneuvers from with the Black Rain discipline. He loses the associated skill of the replaced discipline as a class skill, but gains Spot as a class skill. You must take Exotic Weapons Proficiency (Firearms) at 1st level in order to begin with knowledge of the Black Rain discipline. The other way is to seek out a master of the Black Rain discipline–a martial adept capable of using at least 5th-level maneuvers from the discipline–and training under him. You must train for a month under the master, and spend 1,000 xp at the end of your training. You gain the ability to learn maneuvers from the Black Rain discipline, and add Spot to your martial adept class’s list of class skills. In addition, you may exchange your maneuvers known for maneuvers of the Black Rain discipline. You may exchange one maneuver of each level, and the new maneuvers you learn must be of the same level as the exchanged maneuvers, unlike normal. You must still be proficient in firearms to receive training in Black Rain. Guns don’t belong in every campaign. Many campaign settings either do not have guns as a feature, or specifically do not include guns. In such a case, the Black Rain discipline simply does not have a place in such campaigns. A DM might be willing to allow a player to use firearms and Black Rain, particularly if the characters background provides a compelling justification for it–they are gnomish tinkerer who invented firearms as a new weapon, or they are an adventuring archaeologist who unearthed a cache of ancient weapons–but this should be considered an exception, rather than a rule. In campaigns where firearms are more common, then the discipline should likewise be more spread, perhaps even made a major feature of the setting. Last edited by The Demented One; 2009-03-09 at 04:40 PM. Dust Devil Shot: Strike–Attack rebounds to strike two foes. Iron Caress: Strike–Make a called shot with a firearms attack that deals +1d6 damage. Gather the Storm: Boost–Reload a firearm as a swift action. Hot-Blooded Gunman Bravado: Stance–Take penalty on firearm attack rolls to deal extra damage. Blossom of Iron Petals: Strike–Make firearms attack in a line. Elegant Execution: Boost–Deal bonus damage at point blank or make a coup de grace against a downed enemy. Smoking Steel Parry: Counter–Parry a ranged attack with a firearm. Stare Down Death: Boost–Stabilize and heal. Azure Battle Mandala: Strike–Make a firearms attack with a +20 bonus on the attack roll and deal +2d6 damage. Black Tempest: Boost–Reload a firearm as a swift action for the duration of the encounter. Sublime Marksmanship: Boost–Disarm or sunder with a ranged attack. Inglorious Maiming Shot: Strike–Firearms attack deals 2 Constitution damage, leaves bleeding wound. Trance of Unhesitating Speed: Boost–Draw an attack with a firearm at the beginning of combat. Cruel Shrapnel Cascade: Strike–Attack maims foe, deals ability damage. Deadeye Sniper Gaze: Stance–Ignore range and concealment penalties, deal extra damage on critical hits with firearms. Blossom of Inevitable Demise: Strike–Make firearms attack in a line, deals +10d6 damage. Scarlet Battle Mandala: Strike–Attack automatically threatens a critical hit, deals +10d6 damage. Heaven-Shattering Volley: Boost–Attacks ignore damage reduction, leave bleeding wounds. Lord of Arms: Stance–Gain special bonuses while wielding firearms. Ebon Lotus Blossom Mandala: Strike–Make firearms attack in a line, automatically threatens a critical hit, deals 15d6 damage. Arms: Your bullet lodges itself in your victim’s hand, hindering their use of it. They take a -1 penalty on all attack and damage rolls. Legs: Your bullet pierces the muscles of your foe’s legs, slowing their every movement. They take a -5 penalty on all Balance, Climb, Jump, Swim, and Tumble checks. Vitals: Your bullet leaves a messy, bleeding wound. Each subsequent round, the foe takes an additional point of damage. The additional effects last for 5 rounds. Magical healing equal to the amount of damage dealt by this strike or a Heal check, DC 11 + your highest mental ability score, also ends the effects. Some foes may not be affected by certain called shots. A creature lacking arms, tentacles, claws, or similar appendages cannot be affected by an arms shot; a creature lacking any legs, wings, fins, or similar propulsory appendages cannot be affected by a legs shot, and creature lacking a discernible anatomy (any creature immune to sneak attack damage) is immune to a vitals shot. Reloading a fired gun is an awkward and ponderous task–ejecting the used cartridge, pouring in black powder, loading a ball, ramming it down. But with a quick hand, a masterful finesse, and a through knowledge of the mechanisms of a firearm, such a task can be done in seconds. When you initiate this maneuver, you may load any firearm you are holding. In addition, this maneuver allows you to load a gun even if you cannot use your hands–if, for example, you are holding a pistol in each hand, or have your hands tied behind your back. Through superhuman feats of coordination you can use your mouth, feet, and all your body to help load a gun, as long as you are not fully incapable of movement. Target: Two creatures within ten feet of each other. Deserts are haunted by dust devils, mysterious twisters of sand that few understand. Fewer still understand the maneuver named for them, the elaborate dust devil shot. With a steady hand and a quick mind for geometry, a gunslinger can ricochet his shot off one foe into a second, allowing him to quickly even the odds. As part of this maneuver, you make a single ranged attack with a firearm or ray weapon against an opponent. If the attack hits, you may have the shot ricochet to strike an additional foe within 10 ft. of the first one. You make new attack and damage roll for the ricocheted shot. A true gunslinger must have a deft hand, a calm mind, an unshakable will–but above all, he must have hot blood flowing through his veins, an unconquerable assurance in himself. Gunman who thrive on such bravado can take risky shots with potentially devastating consequences. While in this stance, before you make an attack roll with a ranged weapon (even one that is not a firearm), you may take a penalty on all ranged attack rolls for that round of up to your base attack bonus. If you do, then you gain a bonus equal to the penalty you took on all ranged damage rolls you make in that round. With the patience of a monk watching a lotus flower bloom, a gunslinger can watch the bullet blossom forth from the barrel of his gun, its path guided by calm mind, steady eye, and a quick finger on the trigger. The blossom of iron petals has let a lone gunman slay mobs of foes with a single shot. When you initiate this maneuver, you make a single attack with a firearm or ray weapon as a line attack. You make a single attack roll, and use that for each foe in the area of this maneuver to determine if the attack hits them. However, starting with the third foe, you take a -5 penalty on the attack roll for every target past the first two: -5 for the roll against the third, -10 against the fourth, and so on, to a maximum of -20 against the sixth. If the attack misses a single foe, then it stops, and does not apply to any further foes behind them. You make a separate damage roll for each opponent hit by the attack. Mercy comes from the barrel of a gun, the warm kiss of iron that ends the misery of the wounded. This maneuver has two uses: first, it can be used to enhance attacks made executioner-style, at close range. For one round, any firearm or ray weapon attack you make against an opponent within 30 ft. of you deals an additional 1d6 damage, +1/initiator level. If they are within 10 ft., the attack instead deals an additional 2d6 damage, +1/initiator level. Alternatively, this maneuver can be used to rapidly dispatch a fallen foe. As part of this maneuver, you may make a coup de grace attack with a firearm or ray weapon against any opponent who is helpless and within the first range increment of the gun you are attacking with. Delivering a coup de grace with this maneuver does not provoke attacks of opportunity. In times of desperation and immediate danger, an experienced gunslinger finds that their perception seems to slow down, that everything seems to move much slower. As adrenaline surges through their body, a single moment of perfect action is possible...and if they take it, they can achieve the superhuman. Smoking steel parry allows a gunslinger to accomplish a task most think impossible, deflecting a bullet with a shot of their own. Whenever an opponent makes an attack with a ranged or thrown weapon against you or an ally within 30 ft. of you, after they make their attack roll, you may initiate this maneuver to make a single attack roll with any firearm or ray weapon you are holding. The target of the attack uses the higher of his AC or your attack roll as his effective AC against his attack. Smoking steel parry cannot be used attacks made with weapons more than one size category larger than the weapon you are holding, and you cannot use it if you are flatfooted or otherwise denied your Dexterity bonus to AC. Some men burn with a fire that will not let them succumb to death, an unconquerable spirit that refuses to go gentle into that good night. Unlike most maneuvers, you cannot actively initiate stare down death. Instead, if you have it readied (but not necessarily granted, if you are a Crusader) and are reduced to -1 hp or less (but not if you are reduced to -10 hp and die), it is automatically initiated, even if you are not conscious. You immediately make a stabilization check, adding your initiator level to the base 10% chance you have of stabilizing. In addition, if you successfully stabilize, then you regain a number of hit points equal to your Charisma score (not modifier). This maneuver can only be initiated once per encounter, unlike most. A trained gunslinger does not aim with his eyes alone, nor with the sights of his gun–both are unreliable, and can lead him astray. After years of honing their skills, an adept can master the azure battle mandala, a meditation that allows them to envision an intricate ring of blue circles that center around their foe, allowing them to aim and fire with inhuman precision, the only hint of their prowess a light glinting in their eyes. As part of this maneuver, you make a single ranged attack with a firearm or ray weapon against an opponent with a +20 insight bonus on the attack roll. If the attack hits, it deals an additional 2d6 damage. In the heat of battle, no man has time to be caught reloading his gun. 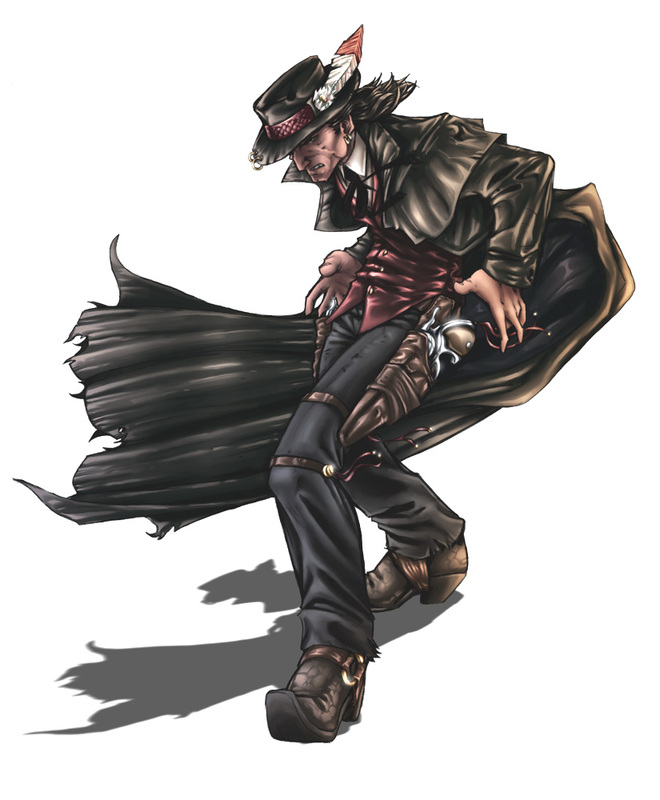 Trained gunslingers can re-arm themselves in seconds, never letting down their onslaught of steel against a foe. For the duration of the encounter, you may reload any firearm you are holding as a swift action. Not all gunslingers are bloodthirsty murderers or ruthless vigilantes. Most see the value of ending a fight without fatally wounding a foe, and have thus honed their skills to shoot an enemy’s weapons out of his hands. For one round, you may disarm foes or sunder weapons with ranged attacks (even if they are not made with firearms) without the usual penalty for doing so. Nothing is more cruel than a bullet in the guts, the cruel, bleeding wound it leaves. Such a shot all but guarantees a slow and miserable death that is worlds apart from the clean kill of a shot to the head. As part of this maneuver, you make a single ranged attack with a firearm or ray weapon against an opponent. If the attack hit, the opponent must make a Fortitude save, DC 14 + your highest mental ability score, or take 2 points of Constitution damage. In addition, they suffer a grievous bleeding wound, causing them to take 1d6 damage each subsequent round for 5 rounds. Magical healing equal to the amount of damage dealt by this strike or a Heal check with DC equal to 14 + your highest mental ability score ends the bleeding. If the bleeding is not healed before the end of the 5 rounds, then the foe takes an additional 2 Constitution damage. Foes that are immune to precision damage are immune to the Constitution damage and bleeding from inglorious maiming shot. Without even thinking, a gunslinger might find that he has already drawn his gun and shot his foe down before he has even consciously realized the threat to him. Unlike most maneuvers, you cannot actively initiate trance of unhesitating speed. Instead, if you have it readied at the beginning of an encounter (but not necessarily granted, if you are a Crusader), it is automatically initiated immediately before the first round of combat, even if you are flatfooted. As part of this maneuver, you may draw a single firearm or ray weapon and either load it or make a single ranged attack with it. You are still flatfooted after using this maneuver; your actions are unconscious and you are still not fully aware of the danger to you. A master gunslinger can perceive in the most fleeting seconds the countless geometries of the battlefield, immediately knowing the path his bullet must take to down his foes. When you initiate this maneuver, you make a single ranged attack with a firearm or ray weapon as a line attack. You make a single attack roll, and use that for each foe in the area of this maneuver to determine if the attack hits them. If the attack misses a single foe, then it stops, and does not apply to any further foes behind them. You make a separate damage roll for each opponent hit by the attack, and the attack deals an additional +6d6 damage. A master gunslinger can be a righteous man, a defender of the innocent; or he can be a cruel and ruthless devil. But whatever he is in his heart of hearts, his soul is a thing of refined glory, a shining exemplar of good or evil. Legendary gunslingers wield their guns not with their hands, but with their very souls, their bullets forged from their own spirit. While in this stance, your ki infuses your guns. Whenever you fire your gun, if it is unloaded, the ki coalesces into a bullet and powder, allowing you to fire your gun without having to ever reload. In addition, the bullets of ki retain a link to you, allowing you to control their motion. You do not have to shoot in a straight line with firearms or ray weapons–instead, you may include a single 90 degree turn in the path of a shot. Arms: Your bullet shreds the foe’s arm muscles, rendering it almost useless. They take 4 Strength damage, and temporarily lose the use of one of their arms, dropping whatever they are holding in it at the time. Legs: Your bullet scatters shrapnel throughout your foe’s legs, leaving them all but unable to stand. They take 4 Dexterity damage and suffer a -10 ft. penalty to all movement forms and a -10 penalty on all Balance, Climb, Jump, Swim, and Tumble checks. Vitals: Your bullet pulps your foe’s innards, leaving them a bleeding, haggard wreck. They take 2 Constitution damage and take 1d12 damage each subsequent round. The additional effects last for 5 rounds. Healing the ability damage also ends the effects, but a Heal check or normal magical healing cannot end them. Some foes may not be affected by certain called shots. A creature lacking arms, tentacles, claws, or similar appendages cannot be affected by an arms shot; a creature lacking any legs, wings, fins, or similar propulsory appendages cannot be affected by a legs shot, and creature lacking a discernible anatomy (any creature immune to sneak attack damage) is immune to a vitals shot. With a good rifle, a trusty scope, and a bit of luck, any soldier can manage to snipe down an enemy from a few hundred yards. A master gunslinger needs neither rifle, nor scope, nor luck–with but a pistol, he could down a foe before his enemy could even see him. While in this stance, you ignore all range penalties on attack rolls, as well as all miss chances from concealment, except for that from total concealment. With purposeful prowess and the graceful finesse that would make angels weep to witness it, you unleash a single bullet upon the battlefield, a bullet that can kill armies. When you initiate this maneuver, you make a single ranged attack with a firearm or ray weapon as a line attack. You make a single attack roll, and use that for each foe in the area of this maneuver to determine if the attack hits them. However, the attack does not stop if it misses a single foe–it continues on, its course altering to accommodate the miss. You make a separate damage roll for each opponent hit by the attack, and the attack deals an additional +10d6 damage. Every gunslinger eventually learns the anatomy of violence, the countless points on the mortal body that produce spectacular wounds when struck with a flying piece of lead, whether by studying medical texts or simply observing the results of their victories. But only once they can call up this knowledge as reflexively as they would draw their gun, aiming for vital weaknesses without thinking, can they master the scarlet battle mandala. As they enter the meditation to call it up, countless elegant red rings manifest in their vision, circling in on their foes’ weak points. Blood surges into the vessels of the gunslinger’s eyes for a split-second, causing his eyes to flash a deep crimson. As part of this maneuver, you make a single ranged attack with a firearm or ray weapon against an opponent. The attack automatically hits regardless of your foe’s AC, and ignores any miss chance due to concealment less than total concealment. The attack automatically threatens a critical hit. If you successfully confirm the critical hit, it deals +10d6 damage. In addition, because the scarlet battle mandala reveals any weaknesses a foe has, not just those of living foes, the critical hit damage and bonus damage from the maneuver still applies against foes normally immune to critical hits, like the undead. Nothing survives the onslaught of a master gunslinger–even the gates of heaven would fall before his righteous steel. His bullets pierce even the most powerful bulwarks, leaving nothing but the flow of blood behind. For the duration of this ability, any ranged attack you make with a firearm or ray weapon ignores all damage reduction except for epic damage reduction. In addition, every firearm attack you make leaves a bleeding wound, causing the foe hit by it to take 2d6 damage each subsequent round. The wounds are so grievous that neither magical healing nor normal Heal checks can stop their flow, though they can heal the damage after it has happened. Regardless of how many attacks you hit a creature with, the damage from bleeding is only 2d6 per round. No man dares cross the true masters of the Black Rain, those gunslingers who claim the title Lord of Arms. They have drawn their weapons into their souls, becoming one with their arsenal. While in this stance, any firearm or ray weapon you wield is treated as being aligned with both aspects of your alignment for overcoming damage reduction, and cannot be sundered or disarmed. In addition, whenever a martial maneuver allows you to make a melee attack, you may instead make a ranged attack with a firearm or ray weapon. In addition, while in this stance, you gain the full benefits of both the Hot-Blooded Gunman Bravado and Righteous Devil Gunslinger stances. Finally, as an immediate action, you may make a firearm or ray weapon attack to parry a ranged attack, as the smoking steel parry maneuver. At the peak of the gunslinger’s art, there lies the ebon battle mandala, the swirling ring of black lotus petals that is uncompromising death for the gunslinger’s foes. To draw up this mandala, the gunslinger closes his eyes, seeing the battlefield with his very soul. When you initiate this maneuver, you make a single ranged attack with a firearm or ray weapon as a line attack. The attack ignores all miss chances from concealment, even total concealment, and for impaired vision or invisible foes–even with your eyes closed, you take no penalty. The attack automatically hits every foe in the maneuver’s area, and automatically threatens a critical hit. You make a separate confirmation roll for each opponent, and a separate damage roll for each opponent hit by the attack. The attack deals an additional +15d6 damage, which increases to +25d6 if you confirm the critical hit. In addition, because the ebon lotus petal mandala reveals any weaknesses a foe has, not just those of living foes, the critical hit damage and bonus damage from the maneuver still applies against foes normally immune to critical hits, like the undead. Last edited by The Demented One; 2009-03-09 at 04:46 PM. This seems to work better as a Stance, but otherwise, this discipline seems to be way cool, dude! That's what Righteous Devil Gunslinger is; I just wanted to give them an easier way to reload between it and Gathering the Storm. You're right, I wasn't thinking. A swift action each round also prohibits them from using other boosts, so all is well. Heaven-shattering volley is listed as a level 4 manuever. I'm also a little concerned about the power level of Ebon Lotus Blossom Mandala. Appart from that though, great flavor and generally awesome. Compare it to Inferno Blast. The concealment-ignoring and auto-hit are basically already part of the whole AoE package it as. And while ELBM as a slightly higher maximum damage (although on average, it's damage with a crit will be about equal to that of Inferno Blast on a failed save), Inferno Blast has a much wider area–unless you're fighting in corridors, you're probably only gonna get one or two creatures when you use the Mandala. Time to roll up a Gunslinger character. I think I'll name him Justice. Good point, I guess I'm just used to the single-target ones. Nice job again. Unusual idea. I like it, though. I particularly like the called shot-style maneuver Iron Caress. In my mind as I was reading, I was hearing the sound of Mustadio of FFT's [Arm Aim] or [Leg Aim]. Just a shame there's no high-level equivalent that works as a ranged disarm or hamstring. Do you have what it takes to face the Uncertainty Lich? So do you have a Gunslinger class lurking somewhere, Demented One, because after reading this over I'm dying to see it. More great work, keep it up. I'm digging your new 3.5 upgrade as well. Cruel Shrapnel Cascade actually does that–ability score damage plus either disabling an arm, dropping their movement speed, or badly bleeding wounds. Sublime Markmanship also allows for ranged disarms. Pistol: 1d10, 20/x3, one bullet capacity, standard action reload. Musket: 1d12, 20/x3, one bullet capacity, standard action reload. Honestly, I hadn't really planned on making a Gunslinger class–I figured a martial adept focusing in Black Rain, or maybe a Fighter/Ranger who took a couple martial study feats is all you need to do that. Thank you, but I can't take credit for d20 Reborn–that's Fax's baby. One question. With Blossom of Righteous Fire and Blossom of Inevitable Death, does the bonus damage apply just to the first target or to all of the targets? I fail to see how "No, that guy is too fat to be hurt by your fire" would make sense. All of them. It's basically just an area of effect maneuver, but with an attack roll. ScS has a Spellshot Pistol that I believe would work with this. Wadledo, you dislike EVERYONE. Therefore, you don't count. Maybe this is the only true fix for spellcasting, making people scared of using it. There's a concept called mercy. Are you familiar with it? Thank ya Dr.Bath for your avataring skills. Bah, my bad. Sorry to you and especially to Fax. I tend to track both yourself and Fax's homebrewing and I guess I crossed wires. The both of you have some truly ingenious works. Well, while I am sad to not see a gunslinger class put together by yourself, perhaps I may challenge myself to make one and extend the challenge to you as well. There is a...wide assortment of D&D suitable guns in one of the Dragon magazines. Most are single shot thought except for revolvers which cost more and can shoot six times before requiring a full round loading action I believe. there are a couple of good ones floating around. i haven't seen any sublime classes yet, but i am sure there are a few. even the nonsublime gun-slingers could get some love out of this discipline with the right feat expenditure. 1)Can Black Rain be used with a Rifle? I was wondering, do you have any feats or PrCs to go with this? Yeah, we get the job done. Dungeons & Dragons obviously - that's why White Wolf won't let their PCs take a look at it. Sadly the game has degenerated into an argument over which suppliments are allowed and who's paying for the pizza... an of course which edition is best. ...Although traditionally of course, the gods play Populous. just thought of something else now that you are running the prc competition. make one of the next competitions about martial maneuver-wielding gunslingers and see what the playground comes up with. Good idea. I may just do that. How is Lord of Arms not overpowered? It lets you do... a lot. Last edited by Tatsel_Ganav; 2009-11-19 at 10:57 PM. Hm. I wonder if this Discipline can be adapted to work with any ranged weapon (bows and crossbows). Other than the Falling Star Disciplines by Fax, ranged weapons don't get a lot of love. This is cool. Really cool. I wanna play a gunslinger now. No need for a specialized class, really. Unarmed swordsage does just fine. Even warblade and crusader fit, depending on your concept. This with lvl's in Grammaton Cleric would rule in d20 modern. Heaven-Shattering Volley doesn't say how long they keep bleeding. As-written, anyone hit by it needs constant magical healing or they'll bleed to death, no way around it. This is pretty neat -- would you mind if I uploaded it to my wiki (see signature)? It would certainly bring it to a wider audience! http://www.dnd-wiki.org -- the Dungeons and Dragons Wiki. The only good spell point system you will ever see. I'm good at rating things. If you want me to tell you how you can improve your homebrew, PM me a link. Smoking Steel Parry is not clear and is in desperate need of rewording. A good background is like a skirt. Short enough to keep my interest, but long enough to cover the important bits. Derailed in the best way, thank you good sir.